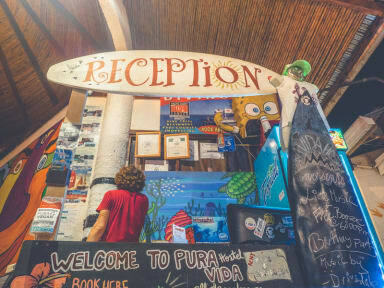 Pura Vida Hostel in Tamarindo, Costa Rica has been providing guests with memorable travel experiences since 2006. We are a friendly, inexpensive hostel that welcomes backpackers and vacationers from all over the world. We welcome the opportunity to host your stay in Tamarindo. Our multi-lingual staff is happy to provide recommendations on restaurants, bars, attractions, getting to your next destination and, of course, surfing. Trips, tours and transportation can be booked at our reception. You can cook and dine al fresco in our 2 spotless, fully-equipped, outdoor communal kitchens. We have dorm beds with ensuite bathrooms and showers and private rooms with air conditioning in multiple configurations to accommodate your travel party. Bed linens are provided. 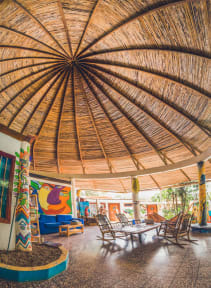 Our “rancho” is the social heart of the hostel with rocking chairs, daybeds, and hammocks for you to enjoy while visiting with other guests and overlooking the lovely tropical garden which enjoys frequent visits from iguanas and howler monkeys. The chill-out atmosphere is enhanced by a great sound system and playlist, good vibes, the fastest wi-fi available in Costa Rica and interesting people from all over the world. We are located a couple hundred meters from the beach, across from the new Banco National and Hertz Rental Car and next door to Dona Lee’s restaurant. We had an amazing stay here! Breakfast is included and the 2 kitchens are super convenient to use. Everything you need is a 5 minute walk down the road and the staff were really good for hooking us up with day tours and transportation. It’s a quiet place but it still has live music a few times a week and a good common area. Awesome spot in Tamarindo! I am actually still at this hostel as I write this, and my inital reservation for five nights expired like three days ago. So that says something. I love this hostel, been here once before, had to come again. The only bad thing i can really say is that the beds are a little old and squeeky, but i dont mind. Other than that, it is great here. Chill, friendly athmosphere, cool staff, great design of the rooms and common area, live music and painting, discount on surf lessons. Recommend it! Tomas at Pura Vida welcomed me for my first time in Costa Rica. Incredibly nice, warm and helpful. The place had a great atmosphere, great people and accommodations. I didn’t get a room with A/C which I would recommend as it’s so hot! I would also just check the distance to the beach (about 10 minutes) which was fine for me but uncomfortable with others. Tamarindo in general was ok. For me in my short stay, I enjoyed Santa Teresa more for the overall relaxed environment, food and beaches. Clean hostel with the exception of some ants in the kitchen but not a big issue. Rooms always thoroughly cleaned and staff always friendly, welcoming and helpful. Not on the main strip so able to sleep at night. Close walk to beach and grocery store. Good communal area. If you’re looking for a really sick atmosphere with really awesome decor and friendly staff and fellow travelers this place is awesome. My only negative comments would be that kitchen was sometimes a little messy and our room was pretty cramped (although I believe they moved extra beds into the room to accommodate us) but it was a short walk to the beach, the the shops and to a grocery store. They have a free water purifier which was a life saver in that heat and we had a really great time! Cool vibes. Friendly and very accommodating staff. People are nice, lot of common areas to hang out. Big kitchen. Dorm rooms have ventilation. Close to all the restaurants, grocery stores and boutiques. 15 minutes walk from the beach. However, we saw a big cockroach in our room and there's a lot of ants in the kitchen. There's no hot water in the shower. It is not a smoke free environment: people smoke in the common area. The hostel is run down but they do the best they can with it! The location is a little out of the way. The people are nice though and common are is great to chill. Crazy friendly and attentive staff. Mattress was least comfortable I’ve ever had and shower in my bathroom dripped nonstop and no hot water, which seems far for the course in CR. Everything felt a little dingy and amateur but decent location. 3/5. I’m really not one to write bad reviews of hostels, because to each their own with hostels. However, I do not understand how this hostel has this high of a rating. It is the worst hostel I’ve ever stayed in. First, it says that there’s A/C, maybe it was just my room, but there was no A/C. Which turned out not to be a bad thing since there was no hot water for the showers which should be noted. The bathroom also looked like it hadn’t been cleaned since 1993 and the sheets were dingy and old.